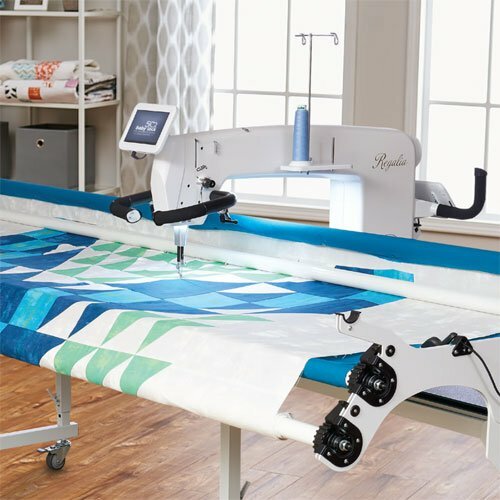 Longarm quilting machines opens up worlds of possibilities for first-time longarm quilters. With a larger workspace, quilters gain complete control over their compositions from beginning to end. And, the built-in stitch regulator ensures smooth, precise stitching for a harmonious finish. In this class, you will learn the basics of longarm quilting. Learn how to properly load a quilt, thread the machine, adjust tensions, and operating the machine using several different free-motion quilting techniques. This class will be taught on the Baby Lock Regalia and Baby Lock Coronet. A detailed instruction book will be provided and all supplies needed to load a sample quilt are included with this course. This course is a pre-requisite for full day rental of our longarm machines. You must retake this class each year in order to renew your certification to rent the Baby Lock Regalia or Coronet in-store. If you have purchased your Baby Lock sewing machine from Urban Spools, this class is offered at no cost. Simply call our store to add yourself to the roster! If you are interested in investing in a Baby Lock sewing machine , this is a more in-depth look at the full features you can expect from a Baby Lock machine. The cost of this course can be applied to the purchase of any Baby Lock machine purchase from Urban Spools within 60 days. See a sales associate for details.